Hi there! It was nice meeting you during your visit to Krystian, and I hope you enjoyed your time in Europe! I went to Ponte Tresa last weekend and found one of your butterflies! 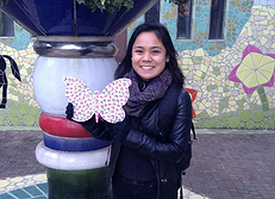 I genuinely appreciate what you’re doing with the butterflies– it’s creative and thoughtful! I’d like the donation to go to Benjamin Walkins (http://www.benjaminwalkins.com/​ ). My friend, Ben, backpacked New Zealand to raise funds for Common Ground, an innercity high school in New Haven, CT that engages “at-risk” teens in environmental education. Also, Krystian told me about how you’re interested in spreading the Butterfly Drop Tribe at Franklin. I’m part of the student government’s Community Development and Initiatives Committee (CDIC), and we’re tasked with community building. I’d love to help establish butterfly drops on campus by making it student government sponsored. Please let me know how that sounds to you! can’t wait to see more butterflies on campus! Please keep in touch!